This season is looking more and more like the fulfillment of a 90s English professor Cultural Studies syllabus. Cause this week we tackle the body. Ah yes, that material entity in which all sorts of social projections are thrust upon, shaping and manipulating our interiors despite our desire to transcend beyond the limitations of our gender, race and physical ability. Let’s see how this symbiotic relationship has severely fucked up the Pearsons. It’s been a while since the past has been the focal point of the episode, but here it’s at its very heart. Mommy Pearson is about to have a hell of a weekend. On the eve of a huge snowstorm, she finds out Kevin and Kate are sick with the chicken pox. Since this is the 80s, the doctor recommends all the kids get it at once, which made me nostalgic for a simpler time when pregnant women could eat raw fish and I didn’t have to worry about birth control being outlawed. Anyway, while Mommy and Daddy Pearson prepare themselves for the constant whining Little Kevin will surely inflict upon them, Rebecca’s evil mom shows up to help with the kids and generally be a stereotype aka Bad Becky. Here’s the thing about Bad Becky. I don’t believe her. Oh, I totally get that racist, rich, white grandmas exist. The thing is she’s so completely obvious in her classism and racism that we go back to the main issue with discussing race in America: we continue to think it’s a perfectly obvious interaction when it’s way more insidious. In this case, she does things like give Randall a basketball, say out loud that it’s surprising he’s the one who was admitted into private school and warns Kate that men only marry women who cook. Again, these are all believable. But since we only see her being awful as opposed to a three-dimensional character, we never have to question her racist status. We know she is one. Little Randall overhears the exchange, which leads to the most cringeworthy explanation of microaggression I have ever heard ever. It was ROUGH. About the only thing that made sense in Jack’s completely nonsensical explanation of subtle racism is Little Randall asking if Grandma shot Dr. King. Which is not only freaking funny but remarkably astute. I mean, she kind of did, in the sense that white supremacy has always been intertwined with the fetishization of white women’s honor. Again, I’m processing a lot right now. Bad Becky comes up with the Uber Becky excuse that she is not a racist, not really. She just finds the whole situation SO. FOREIGN. And to show that she is really trying, swear to god, we watch her ask Randall about his rad science fair project. I assume this is the concession the writers’ room had to make to appease to their Republican viewers. Deja still being moody cause she’s a traumatized tween having a bad hair year and looking forward to a lifetime of systematic racial and gender oppression. Beth and Randall know there are a lot of issues to untangle but they start with the simplest one: her hair. It is a hot mess and, from what Beth says, a pretty smelly one at that. 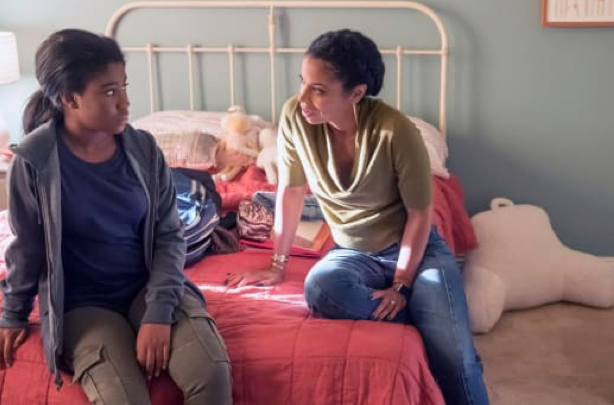 Randall doesn’t want to hurt Deja’s feelings by bringing it up and convinces Beth to not say anything about it quiet yet. We all know that problems disappear if we never address them. Wait, how did he get into private school? Dude has been making one faux pas after another lately. Back home, Deja is packing her bags, convinced she’ll get kicked out. Beth tells her that in this house of horrors, where all kids get an iPad, the big bad consequence is getting grounded. And then, Queen Beth, brings up the subject of her hair in a beautiful, sensitive, non-shameful, body positive way. She tells Deja of her own sisters and how they bonded by taking care of each other’s hair. Deja accepts Beth’s offer to do her hair and it’s then that Beth realizes Deja has alopecia. Beth is so damn perfect in this scene, I want to talk to her about my own body hair issues. Do you know how much I spend on eyebrow waxing, Beth? Do you know how resentful I am that I came of age at a time that the Brazilian became the trend? What do I do about all the stray hairs I get everywhere on everyone cause I can’t control it, Beth? Please hold me. Then Randall has to ruin everything by telling Deja about his nervous breakdowns and letting her know Beth told him about their private conversations. Toby, Toby, Toby. Who are you, Toby? Like, what do you do? Why do you have all this time to bake vegan muffins no one wants and obsess over whether Kevin is taking care of his leg correctly? Kevin decides to get knee surgery. He tries to get it to heal quickly. Says something about his bum knee ruining his football career. Won’t let that happen with acting. Something else about him staring wistfully at old VHS tapes of Jack saying how proud he is of his sun. Literally cannot muster the energy to even pretend to care about this storyline. As for Kate, we see her obsess over her exercise regime during the whole episode. There’s even a whole scene where her eyes linger on the laxative aisle of the pharmacy. Turns out, though, we got ourselves a good old vintage This Is Us twist in our hands. Cause Kate is preggers! She is carrying Toby’s spawn, which is all forms of gross, but we can deal with that implication later. It’s been a while since we had some fuzzy warm surprise ever since Season 2 decided to go dark and edgy (LOL). It’ll be interesting to see how this plays out throughout the year. After all, aren’t pregnancies usually reserved for desperate rating boosts and season finales? Ugh, his relationship with Little Kevin continues to crush me. Showing him how to put mind over matter when dealing with the chicken pox itch was beyond cute. “How you present yourself on the outside, reflects how you feel on the inside.”- Queen Beth and for once I’m actually not making fun of the deep quote. I truly believe in this as well. When the world is chaos, I take extra care of how I look because at least that I can control. It gives me some sense of empowerment. Ok, I think I’ve shared way too much about myself in this recap. Ines out.